"Variola" redirects here. For other uses, see Variola (disambiguation). 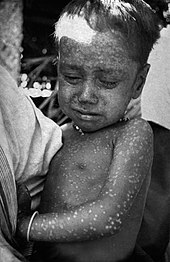 A child with smallpox in Bangladesh in 1973. Note the characteristic bumps filled with thick fluid and a depression or dimple in the center. The initial symptoms of the disease included fever and vomiting. This was followed by formation of sores in the mouth and a skin rash. Over a number of days the skin rash turned into characteristic fluid filled bumps with a dent in the center. The bumps then scabbed over and fell off leaving scars. The disease used to spread between people or via contaminated objects. Prevention was by the smallpox vaccine. Once the disease had developed, certain antiviral medication may have helped. The origin of smallpox is unknown. The earliest evidence of the disease dates to the 3rd century BCE in Egyptian mummies. The disease historically occurred in outbreaks. In 18th-century Europe, it is estimated 400,000 people per year died from the disease, and one-third of the cases resulted in blindness. These deaths included those of four reigning monarchs and a queen consort. Smallpox is estimated to have killed up to 300 million people in the 20th century and around 500 million people in the last 100 years of its existence. As recently as 1967, 15 million cases occurred a year. Edward Jenner discovered in 1798 that vaccination could prevent smallpox. In 1967, the WHO intensified efforts to eliminate the disease. Smallpox is one of two infectious diseases to have been eradicated, the other being rinderpest in 2011. The term "smallpox" was first used in Britain in the 15th century to distinguish the disease from syphilis, which was then known as the "great pox". Other historical names for the disease include pox, speckled monster, and red plague. There were two clinical forms of smallpox. Variola major was the severe and most common form, with a more extensive rash and higher fever. Variola minor was a less common presentation, and a much less severe disease, with historical death rates of one percent or less. Subclinical (asymptomatic) infections with Variola virus were noted but were not common. In addition, a form called variola sine eruptione (smallpox without rash) was seen generally in vaccinated persons. This form was marked by a fever that occurred after the usual incubation period and could be confirmed only by antibody studies or, rarely, by virus isolation. The incubation period between contraction and the first obvious symptoms of the disease was around 12 days. Once inhaled, variola major virus invaded the oropharyngeal (mouth and throat) or the respiratory mucosa, migrated to regional lymph nodes, and began to multiply. In the initial growth phase, the virus seemed to move from cell to cell, but by around the 12th day, lysis of many infected cells occurred and the virus was found in the bloodstream in large numbers (this is called viremia), and a second wave of multiplication occurred in the spleen, bone marrow, and lymph nodes. The initial symptoms were similar to other viral diseases such as influenza and the common cold: fever of at least 38.3 °C (101 °F), muscle pain, malaise, headache and prostration. As the digestive tract was commonly involved, nausea and vomiting and backache often occurred. The prodrome, or preeruptive stage, usually lasted 2–4 days. By days 12–15, the first visible lesions – small reddish spots called enanthem – appeared on mucous membranes of the mouth, tongue, palate, and throat, and temperature fell to near normal. These lesions rapidly enlarged and ruptured, releasing large amounts of virus into the saliva. Smallpox virus preferentially attacked skin cells, causing the characteristic pimples (called macules) associated with the disease. A rash developed on the skin 24 to 48 hours after lesions on the mucous membranes appeared. Typically the macules first appeared on the forehead, then rapidly spread to the whole face, proximal (closer) portions of extremities, the trunk, and lastly to distal (further) portions of extremities. The process takes no more than 24 to 36 hours, after which no new lesions appear. At this point, variola major infection could take several very different courses, resulting in four types of smallpox disease based on the Rao classification: ordinary, modified, malignant (or flat), and hemorrhagic. Historically, smallpox had an overall fatality rate of about 30 percent; the malignant and hemorrhagic forms were usually fatal. Ninety percent or more of smallpox cases among unvaccinated persons were of the ordinary type. In this form of the disease, by the second day of the rash the macules became raised papules. By the third or fourth day the papules filled with an opalescent fluid to become vesicles. This fluid became opaque and turbid within 24–48 hours, giving them the appearance of pustules; the so-called pustules were filled with tissue debris, not pus. By the sixth or seventh day, all the skin lesions have become pustules. Between seven and ten days the pustules matured and reached their maximum size. The pustules were sharply raised, typically round, tense, and firm to the touch. The pustules were deeply embedded in the dermis, giving them the feel of a small bead in the skin. Fluid slowly leaked from the pustules, and by the end of the second week the pustules deflated, and started to dry up, forming crusts (or scabs). By day 16–20 scabs had formed over all the lesions, which had started to flake off, leaving depigmented scars. Ordinary smallpox generally produced a discrete rash, in which the pustules stood out on the skin separately. The distribution of the rash was densest on the face; denser on the extremities than on the trunk; and on the extremities, denser on the distal parts than on the proximal. The palms of the hands and soles of the feet were involved in the majority of cases. Sometimes, the blisters merged into sheets, forming a confluent rash, which began to detach the outer layers of skin from the underlying flesh. Patients with confluent smallpox often remained ill even after scabs had formed over all the lesions. In one case series, the case-fatality rate in confluent smallpox was 62 percent. Referring to the character of the eruption and the rapidity of its development, modified smallpox occurred mostly in previously vaccinated people. In this form the prodromal illness still occurred but may have been less severe than in the ordinary type. There was usually no fever during evolution of the rash. The skin lesions tended to be fewer and evolved more quickly, were more superficial, and may not have shown the uniform characteristic of more typical smallpox. Modified smallpox was rarely, if ever, fatal. This form of variola major was more easily confused with chickenpox. In malignant-type smallpox (also called flat smallpox) the lesions remained almost flush with the skin at the time when raised vesicles would have formed in the ordinary type. It is unknown why some people developed this type. Historically, it accounted for 5–10 percent of cases, and the majority (72 percent) were children. Malignant smallpox was accompanied by a severe prodromal phase that lasted 3–4 days, prolonged high fever, and severe symptoms of toxemia. The rash on the tongue and palate was extensive. Skin lesions matured slowly and by the seventh or eighth day they were flat and appeared to be buried in the skin. Unlike ordinary-type smallpox, the vesicles contained little fluid, were soft and velvety to the touch, and may have contained hemorrhages. Malignant smallpox was nearly always fatal. Hemorrhagic smallpox was a severe form accompanied by extensive bleeding into the skin, mucous membranes, and gastrointestinal tract. This form developed in approximately 2 percent of infections and occurred mostly in adults. In hemorrhagic smallpox the skin did not blister, but remained smooth. Instead, bleeding occurred under the skin, making it look charred and black, hence this form of the disease was also known as black pox. In the early, or fulminating form, hemorrhaging appeared on the second or third day as sub-conjunctival bleeding turned the whites of the eyes deep red. Hemorrhagic smallpox also produced a dusky erythema, petechiae, and hemorrhages in the spleen, kidney, serosa, muscle, and, rarely, the epicardium, liver, testes, ovaries and bladder. Death often occurred suddenly between the fifth and seventh days of illness, when only a few insignificant skin lesions were present. A later form of the disease occurred in patients who survived for 8–10 days. The hemorrhages appeared in the early eruptive period, and the rash was flat and did not progress beyond the vesicular stage. Patients in the early stage of disease showed a decrease in coagulation factors (e.g. platelets, prothrombin, and globulin) and an increase in circulating antithrombin. Patients in the late stage had significant thrombocytopenia; deficiency of coagulation factors was less severe. Some in the late stage also showed increased antithrombin. This form of smallpox occurred in anywhere from 3 to 25 percent of fatal cases depending on the virulence of the smallpox strain. Hemorrhagic smallpox was usually fatal. Smallpox was caused by infection with Variola virus, which belongs to the genus Orthopoxvirus, the family Poxviridae and subfamily Chordopoxvirinae. The date of the appearance of smallpox is not settled. It most likely evolved from a terrestrial African rodent virus between 68,000 and 16,000 years ago. The wide range of dates is due to the different records used to calibrate the molecular clock. One clade was the variola major strains (the more clinically severe form of smallpox) which spread from Asia between 400 and 1,600 years ago. A second clade included both alastrim minor (a phenotypically mild smallpox) described from the American continents and isolates from West Africa which diverged from an ancestral strain between 1,400 and 6,300 years before present. This clade further diverged into two subclades at least 800 years ago. A second estimate has placed the separation of variola from Taterapox (an Orthopox virus of some African rodents including gerbils) at 3,000 to 4,000 years ago. This is consistent with archaeological and historical evidence regarding the appearance of smallpox as a human disease which suggests a relatively recent origin. If the mutation rate is assumed to be similar to that of the herpesviruses, the divergence date of variola from Taterapox has been estimated to be 50,000 years ago. While this is consistent with the other published estimates, it suggests that the archaeological and historical evidence is very incomplete. Better estimates of mutation rates in these viruses are needed. Examination of a strain that dates from c. 1650 found that this strain was basal to the other presently sequenced strains. The mutation rate of this virus is well modeled by a molecular clock. Diversification of strains only occurred in the 18th and 19th centuries. Variola is a large brick-shaped virus measuring approximately 302 to 350 nanometers by 244 to 270 nm, with a single linear double stranded DNA genome 186 kilobase pairs (kbp) in size and containing a hairpin loop at each end. The two classic varieties of smallpox are variola major and variola minor. The life cycle of poxviruses is complicated by having multiple infectious forms, with differing mechanisms of cell entry. Poxviruses are unique among DNA viruses in that they replicate in the cytoplasm of the cell rather than in the nucleus. In order to replicate, poxviruses produce a variety of specialized proteins not produced by other DNA viruses, the most important of which is a viral-associated DNA-dependent RNA polymerase. Transmission occurred through inhalation of airborne Variola virus, usually droplets expressed from the oral, nasal, or pharyngeal mucosa of an infected person. It was transmitted from one person to another primarily through prolonged face-to-face contact with an infected person, usually within a distance of 1.8 m (6 feet), but could also be spread through direct contact with infected bodily fluids or contaminated objects (fomites) such as bedding or clothing. Rarely, smallpox was spread by virus carried in the air in enclosed settings such as buildings, buses, and trains. The virus can cross the placenta, but the incidence of congenital smallpox was relatively low. Smallpox was not notably infectious in the prodromal period and viral shedding was usually delayed until the appearance of the rash, which was often accompanied by lesions in the mouth and pharynx. The virus can be transmitted throughout the course of the illness, but this happened most frequently during the first week of the rash, when most of the skin lesions were intact. Infectivity waned in 7 to 10 days when scabs formed over the lesions, but the infected person was contagious until the last smallpox scab fell off. Smallpox was highly contagious, but generally spread more slowly and less widely than some other viral diseases, perhaps because transmission required close contact and occurred after the onset of the rash. The overall rate of infection was also affected by the short duration of the infectious stage. In temperate areas, the number of smallpox infections was highest during the winter and spring. In tropical areas, seasonal variation was less evident and the disease was present throughout the year. Age distribution of smallpox infections depended on acquired immunity. Vaccination immunity declined over time and was probably lost within thirty years. Smallpox was not known to be transmitted by insects or animals and there was no asymptomatic carrier state. The clinical definition of smallpox is an illness with acute onset of fever equal to or greater than 38.3 °C (101 °F) followed by a rash characterized by firm, deep seated vesicles or pustules in the same stage of development without other apparent cause. When a clinical case was observed, smallpox was confirmed using laboratory tests. Microscopically, poxviruses produce characteristic cytoplasmic inclusions, the most important of which are known as Guarnieri bodies, and are the sites of viral replication. Guarnieri bodies are readily identified in skin biopsies stained with hematoxylin and eosin, and appear as pink blobs. They are found in virtually all poxvirus infections but the absence of Guarnieri bodies could not be used to rule out smallpox. The diagnosis of an orthopoxvirus infection can also be made rapidly by electron microscopic examination of pustular fluid or scabs. All orthopoxviruses exhibit identical brick-shaped virions by electron microscopy. If particles with the characteristic morphology of herpesviruses are seen this will eliminate smallpox and other orthopoxvirus infections. Definitive laboratory identification of Variola virus involved growing the virus on chorioallantoic membrane (part of a chicken embryo) and examining the resulting pock lesions under defined temperature conditions. Strains were characterized by polymerase chain reaction (PCR) and restriction fragment length polymorphism (RFLP) analysis. Serologic tests and enzyme linked immunosorbent assays (ELISA), which measured Variola virus-specific immunoglobulin and antigen were also developed to assist in the diagnosis of infection. Chickenpox was commonly confused with smallpox in the immediate post-eradication era. Chickenpox and smallpox could be distinguished by several methods. Unlike smallpox, chickenpox does not usually affect the palms and soles. Additionally, chickenpox pustules are of varying size due to variations in the timing of pustule eruption: smallpox pustules are all very nearly the same size since the viral effect progresses more uniformly. A variety of laboratory methods were available for detecting chickenpox in evaluation of suspected smallpox cases. Smallpox virus lesions on the chorioallantoic membrane of a developing chick. In contrast to the rash in smallpox, the rash in chickenpox occurred mostly on the torso, spreading less to the limbs. An Italian female smallpox patient whose skin displayed the characteristics of late-stage confluent maculopapular scarring, 1965. Components of a modern smallpox vaccination kit including the diluent, a vial of Dryvax vaccinia vaccine, and a bifurcated needle. The earliest procedure used to prevent smallpox was inoculation (known as variolation after the introduction of smallpox vaccine to avoid possible confusion), which likely occurred in India, Africa, and China well before the practice arrived in Europe. The idea that inoculation originated in India has been challenged, as few of the ancient Sanskrit medical texts described the process of inoculation. Accounts of inoculation against smallpox in China can be found as early as the late 10th century, and the procedure was widely practiced by the 16th century, during the Ming dynasty. If successful, inoculation produced lasting immunity to smallpox. Because the person was infected with Variola virus, a severe infection could result, and the person could transmit smallpox to others. Variolation had a 0.5–2 percent mortality rate, considerably less than the 20–30 percent mortality rate of the disease. Two reports on the Chinese practice of inoculation were received by the Royal Society in London in 1700; one by Dr. Martin Lister who received a report by an employee of the East India Company stationed in China and another by Clopton Havers. Lady Mary Wortley Montagu observed smallpox inoculation during her stay in the Ottoman Empire, writing detailed accounts of the practice in her letters, and enthusiastically promoted the procedure in England upon her return in 1718. In 1721, Cotton Mather and colleagues provoked controversy in Boston by inoculating hundreds. In 1796, Edward Jenner, a doctor in Berkeley, Gloucestershire, rural England, discovered that immunity to smallpox could be produced by inoculating a person with material from a cowpox lesion. Cowpox is a poxvirus in the same family as variola. Jenner called the material used for inoculation vaccine, from the root word vacca, which is Latin for cow. The procedure was much safer than variolation and did not involve a risk of smallpox transmission. Vaccination to prevent smallpox was soon practiced all over the world. During the 19th century, the cowpox virus used for smallpox vaccination was replaced by vaccinia virus. Vaccinia is in the same family as cowpox and variola, but is genetically distinct from both. The origin of vaccinia virus and how it came to be in the vaccine are not known. According to Voltaire (1742), the Turks derived their use of inoculation from neighbouring Circassia. Voltaire does not speculate on where the Circassians derived their technique from, though he reports that the Chinese have practiced it "these hundred years". 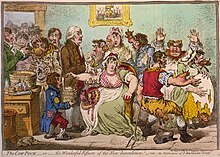 An 1802 cartoon of the early controversy surrounding Edward Jenner's vaccination theory, showing using his cowpox-derived smallpox vaccine causing cattle to emerge from patients. The current formulation of smallpox vaccine is a live virus preparation of infectious vaccinia virus. The vaccine is given using a bifurcated (two-pronged) needle that is dipped into the vaccine solution. The needle is used to prick the skin (usually the upper arm) a number of times in a few seconds. If successful, a red and itchy bump develops at the vaccine site in three or four days. In the first week, the bump becomes a large blister (called a "Jennerian vesicle") which fills with pus, and begins to drain. During the second week, the blister begins to dry up and a scab forms. The scab falls off in the third week, leaving a small scar. The antibodies induced by vaccinia vaccine are cross-protective for other orthopoxviruses, such as monkeypox, cowpox, and variola (smallpox) viruses. Neutralizing antibodies are detectable 10 days after first-time vaccination, and seven days after revaccination. Historically, the vaccine has been effective in preventing smallpox infection in 95 percent of those vaccinated. Smallpox vaccination provides a high level of immunity for three to five years and decreasing immunity thereafter. If a person is vaccinated again later, immunity lasts even longer. 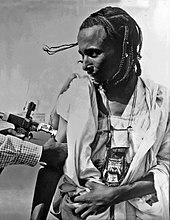 Studies of smallpox cases in Europe in the 1950s and 1960s demonstrated that the fatality rate among persons vaccinated less than 10 years before exposure was 1.3 percent; it was 7 percent among those vaccinated 11 to 20 years prior, and 11 percent among those vaccinated 20 or more years prior to infection. By contrast, 52 percent of unvaccinated persons died. A demonstration by medical personnel on use of a bifurcated needle to deliver the smallpox vaccine, 2002. Given these risks, as smallpox became effectively eradicated and the number of naturally occurring cases fell below the number of vaccine-induced illnesses and deaths, routine childhood vaccination was discontinued in the United States in 1972 and was abandoned in most European countries in the early 1970s. Routine vaccination of health care workers was discontinued in the U.S. in 1976, and among military recruits in 1990 (although military personnel deploying to the Middle East and Korea still receive the vaccination). By 1986, routine vaccination had ceased in all countries. It is now primarily recommended for laboratory workers at risk for occupational exposure. In July 2018, the Food and Drug Administration approved tecovirimat, the first drug approved for treatment of smallpox. Antiviral treatments have improved since the last large smallpox epidemics, and studies suggest that the antiviral drug cidofovir might be useful as a therapeutic agent. The drug must be administered intravenously, and may cause serious kidney toxicity. ACAM2000 is a smallpox vaccine developed by Acambis. It was approved for use in the United States by the U.S. FDA on August 31, 2007. It contains live vaccinia virus, cloned from the same strain used in an earlier vaccine, Dryvax. While the Dryvax virus was cultured in the skin of calves and freeze-dried, ACAM2000s virus is cultured in kidney epithelial cells (Vero cells) from an African green monkey. Efficacy and adverse reaction incidence are similar to Dryvax. The vaccine is not routinely available to the US public; it is, however, used in the military and maintained in the Strategic National Stockpile. The overall case-fatality rate for ordinary-type smallpox is about 30 percent, but varies by pock distribution: ordinary type-confluent is fatal about 50–75 percent of the time, ordinary-type semi-confluent about 25–50 percent of the time, in cases where the rash is discrete the case-fatality rate is less than 10 percent. The overall fatality rate for children younger than 1 year of age is 40–50 percent. Hemorrhagic and flat types have the highest fatality rates. The fatality rate for flat-type is 90 percent or greater and nearly 100 percent is observed in cases of hemorrhagic smallpox. The case-fatality rate for variola minor is 1 percent or less. There is no evidence of chronic or recurrent infection with Variola virus. Other complications include encephalitis (1 in 500 patients), which is more common in adults and may cause temporary disability; permanent pitted scars, most notably on the face; and complications involving the eyes (2 percent of all cases). Pustules can form on the eyelid, conjunctiva, and cornea, leading to complications such as conjunctivitis, keratitis, corneal ulcer, iritis, iridocyclitis, and optic atrophy. Blindness results in approximately 35 percent to 40 percent of eyes affected with keratitis and corneal ulcer. Hemorrhagic smallpox can cause subconjunctival and retinal hemorrhages. In 2 to 5 percent of young children with smallpox, virions reach the joints and bone, causing osteomyelitis variolosa. Lesions are symmetrical, most common in the elbows, tibia, and fibula, and characteristically cause separation of an epiphysis and marked periosteal reactions. Swollen joints limit movement, and arthritis may lead to limb deformities, ankylosis, malformed bones, flail joints, and stubby fingers. The earliest credible clinical evidence of smallpox is found in the smallpox-like disease in medical writings from ancient India (as early as 1500 BCE), Egyptian mummy of Ramses V who died more than 3000 years ago (1145 BCE) and China (1122 BCE). It has been speculated that Egyptian traders brought smallpox to India during the 1st millennium BCE, where it remained as an endemic human disease for at least 2000 years. Smallpox was probably introduced into China during the 1st century CE from the southwest, and in the 6th century was carried from China to Japan. In Japan, the epidemic of 735–737 is believed to have killed as much as one-third of the population. 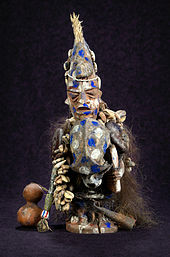 At least seven religious deities have been specifically dedicated to smallpox, such as the god Sopona in the Yoruba religion. In India, the Hindu goddess of smallpox, Sitala Mata, was worshiped in temples throughout the country. A different viewpoint is that smallpox emerged 1588 CE and the earlier reported cases were incorrectly identified as smallpox. The timing of the arrival of smallpox in Europe and south-western Asia is less clear. Smallpox is not clearly described in either the Old or New Testaments of the Bible or in the literature of the Greeks or Romans. While some have identified the Plague of Athens – which was said to have originated in "Ethiopia" and Egypt – or the plague that lifted Carthage's 396 BCE siege of Syracuse – with smallpox, many scholars agree it is very unlikely such a serious disease as variola major would have escaped being described by Hippocrates if it had existed in the Mediterranean region during his lifetime. While the Antonine Plague that swept through the Roman Empire in 165–180 CE may have been caused by smallpox, Saint Nicasius of Rheims became the patron saint of smallpox victims for having supposedly survived a bout in 450, and Saint Gregory of Tours recorded a similar outbreak in France and Italy in 580, the first use of the term variola; other historians speculate that Arab armies first carried smallpox from Africa into Southwestern Europe during the 7th and 8th centuries. In the 9th century the Persian physician, Rhazes, provided one of the most definitive descriptions of smallpox and was the first to differentiate smallpox from measles and chickenpox in his Kitab fi al-jadari wa-al-hasbah (The Book of Smallpox and Measles). During the Middle Ages, smallpox made periodic incursions into Europe but did not become established there until the population increased and population movement became more active during the era of the Crusades. By the 16th century smallpox had become well established across most of Europe. With its introduction into populated areas in India, China and Europe, smallpox affected mainly children, with periodic epidemics that killed as many as 30 percent of those infected. The settled existence of smallpox in Europe was of particular historical importance, since successive waves of exploration and colonization by Europeans tended to spread the disease to other parts of the world. By the 16th century it had become an important cause of morbidity and mortality throughout much of the world. 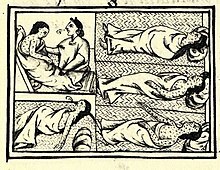 Drawing accompanying text in Book XII of the 16th-century Florentine Codex (compiled 1555–1576), showing Nahuas of conquest-era central Mexico with smallpox. There are no credible descriptions of smallpox-like disease in the Americas before the westward exploration by Europeans in the 15th century CE. Smallpox was introduced into the Caribbean island of Hispaniola in 1509, and into the mainland in 1520, when Spanish settlers from Hispaniola arrived in Mexico bringing smallpox with them. Smallpox devastated the native Amerindian population and was an important factor in the conquest of the Aztecs and the Incas by the Spaniards. Settlement of the east coast of North America in 1633 in Plymouth, Massachusetts was also accompanied by devastating outbreaks of smallpox among Native American populations, and subsequently among the native-born colonists. Case fatality rates during outbreaks in Native American populations were as high as 80–90%. Smallpox was introduced into Australia in 1789 and again in 1829. Although the disease was never endemic on the continent, it was the principal cause of death in Aboriginal populations between 1780 and 1870. By the mid-18th century smallpox was a major endemic disease everywhere in the world except in Australia and in several small islands. In Europe smallpox was a leading cause of death in the 18th century, killing an estimated 400,000 Europeans each year. Up to 10 percent of Swedish infants died of smallpox each year, and the death rate of infants in Russia may have been even higher. The widespread use of variolation in a few countries, notably Great Britain, its North American colonies, and China, somewhat reduced the impact of smallpox among the wealthy classes during the latter part of the 18th century, but a real reduction in its incidence did not occur until vaccination became a common practice toward the end of the 19th century. Improved vaccines and the practice of re-vaccination led to a substantial reduction in cases in Europe and North America, but smallpox remained almost unchecked everywhere else in the world. In the United States and South Africa a much milder form of smallpox, variola minor, was recognized just before the close of the 19th century. By the mid-20th century variola minor occurred along with variola major, in varying proportions, in many parts of Africa. Patients with variola minor experience only a mild systemic illness, are often ambulant throughout the course of the disease, and are therefore able to more easily spread disease. Infection with v. minor induces immunity against the more deadly variola major form. Thus as v. minor spread all over the US, into Canada, the South American countries and Great Britain it became the dominant form of smallpox, further reducing mortality rates. The first clear reference to smallpox inoculation was made by the Chinese author Wan Quan (1499–1582) in his Douzhen xinfa (痘疹心法) published in 1549, with earliest hints of the practice in China during the 10th century. In China, powdered smallpox scabs were blown up the noses of the healthy. People would then develop a mild case of the disease and from then on were immune to it. The technique did have a 0.5–2.0% mortality rate, but that was considerably less than the 20–30% mortality rate of the disease itself. Two reports on the Chinese practice of inoculation were received by the Royal Society in London in 1700; one by Dr. Martin Lister who received a report by an employee of the East India Company stationed in China and another by Clopton Havers. Voltaire (1742) reports that the Chinese had practiced smallpox inoculation "these hundred years". The English physician Edward Jenner demonstrated the effectiveness of cowpox to protect humans from smallpox in 1796, after which various attempts were made to eliminate smallpox on a regional scale. 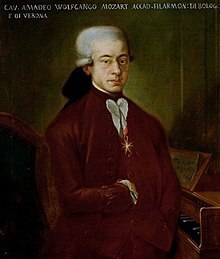 In Russia in 1796, the first child to receive this treatment was bestowed the name "Vaccinov" by Catherine the Great, and was educated at the expense of the nation. The introduction of the vaccine to the New World took place in Trinity, Newfoundland in 1800 by Dr. John Clinch, boyhood friend and medical colleague of Jenner. As early as 1803, the Spanish Crown organized the Balmis expedition to transport the vaccine to the Spanish colonies in the Americas and the Philippines, and establish mass vaccination programs there. The U.S. Congress passed the Vaccine Act of 1813 to ensure that safe smallpox vaccine would be available to the American public. By about 1817, a very solid state vaccination program existed in the Dutch East Indies. In British India a program was launched to propagate smallpox vaccination, through Indian vaccinators, under the supervision of European officials. Nevertheless, British vaccination efforts in India, and in Burma in particular, were hampered by stubborn indigenous preference for inoculation and distrust of vaccination, despite tough legislation, improvements in the local efficacy of the vaccine and vaccine preservative, and education efforts. By 1832, the federal government of the United States established a smallpox vaccination program for Native Americans. In 1842, the United Kingdom banned inoculation, later progressing to mandatory vaccination. The British government introduced compulsory smallpox vaccination by an Act of Parliament in 1853. In the United States, from 1843 to 1855 first Massachusetts, and then other states required smallpox vaccination. Although some disliked these measures, coordinated efforts against smallpox went on, and the disease continued to diminish in the wealthy countries. In Northern Europe a number of countries had eliminated smallpox by 1900, and by 1914, the incidence in most industrialized countries had decreased to comparatively low levels. Vaccination continued in industrialized countries, until the mid to late 1970s as protection against reintroduction. Australia and New Zealand are two notable exceptions; neither experienced endemic smallpox and never vaccinated widely, relying instead on protection by distance and strict quarantines. The first hemisphere-wide effort to eradicate smallpox was made in 1950 by the Pan American Health Organization. The campaign was successful in eliminating smallpox from all American countries except Argentina, Brazil, Colombia, and Ecuador. In 1958 Professor Viktor Zhdanov, Deputy Minister of Health for the USSR, called on the World Health Assembly to undertake a global initiative to eradicate smallpox. The proposal (Resolution WHA11.54) was accepted in 1959. At this point, 2 million people were dying from smallpox every year. Overall, the progress towards eradication was disappointing, especially in Africa and in the Indian subcontinent. In 1966 an international team, the Smallpox Eradication Unit, was formed under the leadership of an American, Donald Henderson. In 1967, the World Health Organization intensified the global smallpox eradication by contributing $2.4 million annually to the effort, and adopted the new disease surveillance method promoted by Czech epidemiologist Karel Raška. 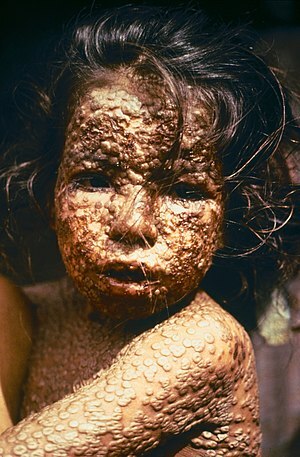 Two-year-old Rahima Banu of Bangladesh (pictured) was the last person infected with naturally occurring Variola major, in 1975. In the early 1950s an estimated 50 million cases of smallpox occurred in the world each year. To eradicate smallpox, each outbreak had to be stopped from spreading, by isolation of cases and vaccination of everyone who lived close by. This process is known as "ring vaccination". The key to this strategy was the monitoring of cases in a community (known as surveillance) and containment. The initial problem the WHO team faced was inadequate reporting of smallpox cases, as many cases did not come to the attention of the authorities. The fact that humans are the only reservoir for smallpox infection, and that carriers did not exist, played a significant role in the eradication of smallpox. The WHO established a network of consultants who assisted countries in setting up surveillance and containment activities. Early on, donations of vaccine were provided primarily by the Soviet Union and the United States, but by 1973, more than 80 percent of all vaccine was produced in developing countries. 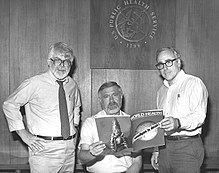 Three former directors of the Global Smallpox Eradication Program read the news that smallpox had been globally eradicated, 1980. The last cases of smallpox in the world occurred in an outbreak of two cases (one of which was fatal) in Birmingham, United Kingdom, in 1978. A medical photographer, Janet Parker, contracted the disease at the University of Birmingham Medical School and died on 11 September 1978. Professor Henry Bedson, the scientist responsible for smallpox research at the university, killed himself. All known stocks of smallpox were subsequently destroyed or transferred to two WHO-designated reference laboratories with BSL-4 facilities – the United States' Centers for Disease Control and Prevention (CDC) and Russia's State Research Center of Virology and Biotechnology VECTOR. WHO first recommended destruction of the virus in 1986 and later set the date of destruction to be 30 December 1993. This was postponed to 30 June 1999. Due to resistance from the U.S. and Russia, in 2002 the World Health Assembly agreed to permit the temporary retention of the virus stocks for specific research purposes. Destroying existing stocks would reduce the risk involved with ongoing smallpox research; the stocks are not needed to respond to a smallpox outbreak. Some scientists have argued that the stocks may be useful in developing new vaccines, antiviral drugs, and diagnostic tests; a 2010 review by a team of public health experts appointed by WHO concluded that no essential public health purpose is served by the U.S. and Russia continuing to retain virus stocks. The latter view is frequently supported in the scientific community, particularly among veterans of the WHO Smallpox Eradication Program. In March 2004, smallpox scabs were found inside an envelope in a book on Civil War medicine in Santa Fe, New Mexico. The envelope was labeled as containing scabs from a vaccination and gave scientists at the CDC an opportunity to study the history of smallpox vaccination in the United States. On July 1, 2014, six sealed glass vials of smallpox dated 1954, along with sample vials of other pathogens, were discovered in a cold storage room in an FDA laboratory at the National Institutes of Health location in Bethesda, Maryland. The smallpox vials were subsequently transferred to the custody of the CDC in Atlanta, where virus taken from at least two vials proved viable in culture. After studies were conducted, the CDC destroyed the virus under WHO observation on February 24, 2015. In 2017, Canadian scientists recreated an extinct horse pox virus to demonstrate that the smallpox virus can be recreated in a small lab at a cost of about $100,000, by a team of scientists without specialist knowledge. This makes the retention controversy moot since the virus can be easily recreated even if all samples are destroyed. Although the scientists performed the research to help development of new vaccines as well as trace smallpox's history, the possibility of the techniques being used for nefarious purposes was immediately recognized, leading to new regulation questions. The British used smallpox as a biological warfare agent at the Siege of Fort Pitt during the French and Indian Wars (1754–1763) against France and its Native American allies. The actual use of smallpox had official sanction. British officers, including the top British commanding generals, ordered, sanctioned, paid for and conducted the use of smallpox against the Native Americans. 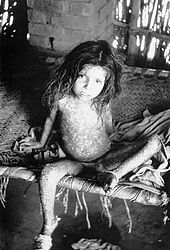 As described by historians, "there is no doubt that British military authorities approved of attempts to spread smallpox among the enemy", and "it was deliberate British policy to infect the Indians with smallpox". On 24 June 1763, William Trent, a local trader and commander of the Fort Pitt militia, wrote, "Out of our regard for them, we gave them two Blankets and an Handkerchief out of the Small Pox Hospital. I hope it will have the desired effect." The effectiveness of this effort to broadcast the disease is unknown. There are also accounts that smallpox was used as a weapon during the American Revolutionary War (1775–1783). According to a theory put forward in Journal of Australian Studies (JAS) by independent researcher Christopher Warren, British marines used smallpox in 1789 against indigenous tribes in New South Wales. This theory was also considered earlier in Bulletin of the History of Medicine and by David Day in his book Claiming a Continent: A New History of Australia. However it is disputed by some medical academics, including Professor Jack Carmody, who in 2010 claimed that the rapid spread of the outbreak in question was more likely indicative of chickenpox—a disease which, at the time, was often confused, even by surgeons, with smallpox, and was in fact comparably deadly to Aborigines and to other peoples without natural immunity to it. Carmody noted that in the 8-month voyage of the First Fleet and the following 14 months there were no reports of smallpox amongst the colonists and that, since smallpox has an incubation period of 10–12 days, it is unlikely it was present in the first fleet; however, Warren argued in the JAS article that the likely source was bottles of smallpox virus possessed by First Fleet surgeons. Ian and Jennifer Glynn, in The life and death of smallpox, confirm that bottles of "variolous matter" were carried to Australia for use as a vaccine, but think it unlikely the virus could have survived till 1789. In 2007, Christopher Warren offered evidence that the British smallpox may have been still viable. However, the only non Aborigine reported to have died in this outbreak was a seaman called Joseph Jeffries, who was recorded as being of "American Indian" origin. W. S. Carus, an expert in biological weapons, has written that there is circumstantial evidence that smallpox was deliberately introduced to the Aboriginal population. However Carmody and the Australian National University's Boyd Hunter continue to support the chickenpox hypothesis. During World War II, scientists from the United Kingdom, United States and Japan (Unit 731 of the Imperial Japanese Army) were involved in research into producing a biological weapon from smallpox. Plans of large scale production were never carried through as they considered that the weapon would not be very effective due to the wide-scale availability of a vaccine. On Vozrozhdeniya Island in the Aral Sea, the strongest recipes of smallpox were tested. Suddenly I was informed that there were mysterious cases of mortalities in Aralsk. A research ship of the Aral fleet came to within 15 km of the island (it was forbidden to come any closer than 40 km). The lab technician of this ship took samples of plankton twice a day from the top deck. The smallpox formulation – 400 gr. of which was exploded on the island – "got her" and she became infected. After returning home to Aralsk, she infected several people including children. All of them died. I suspected the reason for this and called the Chief of General Staff of Ministry of Defense and requested to forbid the stop of the Alma-Ata–Moscow train in Aralsk. As a result, the epidemic around the country was prevented. I called Andropov, who at that time was Chief of KGB, and informed him of the exclusive recipe of smallpox obtained on Vozrazhdenie Island. Responding to international pressures, in 1991 the Soviet government allowed a joint U.S.–British inspection team to tour four of its main weapons facilities at Biopreparat. The inspectors were met with evasion and denials from the Soviet scientists, and were eventually ordered out of the facility. In 1992 Soviet defector Ken Alibek alleged that the Soviet bioweapons program at Zagorsk had produced a large stockpile – as much as twenty tons – of weaponized smallpox (possibly engineered to resist vaccines, Alibek further alleged), along with refrigerated warheads to deliver it. Alibek's stories about the former Soviet program's smallpox activities have never been independently verified. In 1997, the Russian government announced that all of its remaining smallpox samples would be moved to the Vector Institute in Koltsovo. With the breakup of the Soviet Union and unemployment of many of the weapons program's scientists, U.S. government officials have expressed concern that smallpox and the expertise to weaponize it may have become available to other governments or terrorist groups who might wish to use virus as means of biological warfare. Specific allegations made against Iraq in this respect proved to be false. Concern has been expressed by some that artificial gene synthesis could be used to recreate the virus from existing digital genomes, for use in biological warfare. Insertion of the synthesized smallpox DNA into existing related pox viruses could theoretically be used to recreate the virus. The first step to mitigating this risk, it has been suggested, should be to destroy the remaining virus stocks so as to enable unequivocal criminalization of any possession of the virus. Famous historical figures who contracted smallpox include Lakota Chief Sitting Bull, Ramses V of Egypt, the Kangxi Emperor (survived), Shunzhi Emperor and Tongzhi Emperor (refer to the official history) of China, Emperor Komei of Japan (died of smallpox in 1867), and Date Masamune of Japan (who lost an eye to the disease). Cuitláhuac, the 10th tlatoani (ruler) of the Aztec city of Tenochtitlan, died of smallpox in 1520, shortly after its introduction to the Americas, and the Incan emperor Huayna Capac died of it in 1527. More recent public figures include Guru Har Krishan, 8th Guru of the Sikhs, in 1664, Peter II of Russia in 1730 (died), George Washington (survived), king Louis XV in 1774 (died) and Maximilian III Joseph, Elector of Bavaria in 1777. In Europe, deaths from smallpox often changed dynastic succession. The only surviving son of Henry VIII, Edward VI, died from complications shortly after apparently recovering from the disease, thereby nullifying Henry's efforts to ensure a male successor to the throne (his two immediate successors were both women, who had both had it and survived). Louis XV of France succeeded his great-grandfather Louis XIV through a series of deaths of smallpox or measles among those earlier in the succession line. He himself died of the disease in 1774. William III lost his mother to the disease when he was only ten years old in 1660, and named his uncle Charles as legal guardian: her death from smallpox would indirectly spark a chain of events that would eventually lead to the permanent ousting of the Stuart line from the British throne. William III's wife, Mary II of England, died from smallpox as well. In Russia, Peter II of Russia died of the disease at 15 years of age. Also, prior to becoming Russian Emperor, Peter III caught the virus and suffered greatly from it. He was left scarred and disfigured. His wife, Catherine the Great, was spared but fear of the virus clearly had its effects on her. She feared for her son and heir Pavel's safety so much that she made sure that large crowds were kept at bay and sought to isolate him. Eventually, she decided to have herself inoculated by a Scottish doctor, Thomas Dimsdale. While this was considered a controversial method at the time, she succeeded. Her son Pavel was later inoculated as well. Catherine then sought to have inoculations throughout her empire stating: "My objective was, through my example, to save from death the multitude of my subjects who, not knowing the value of this technique, and frightened of it, were left in danger." By 1800, approximately 2 million inoculations were administered in the Russian Empire. In China, the Qing dynasty had extensive protocols to protect Manchus from Peking's endemic smallpox. Soviet leader Joseph Stalin fell ill with smallpox at the age of seven. His face was badly scarred by the disease. He later had photographs retouched to make his pockmarks less apparent. The Hindu goddess Shitala was worshipped to prevent or cure smallpox. In the face of the devastation of smallpox, various smallpox gods and goddesses have been worshipped throughout parts of the Old World, for example in China and in India. In China, the smallpox goddess was referred to as T'ou-Shen Niang-Niang. Chinese believers actively worked to appease the goddess and pray for her mercy, by such measures as referring to smallpox pustules as "beautiful flowers" as a euphemism intended to avert offending the goddess, for example (the Chinese word for smallpox is 天花, literally "heaven flower"). In a related New Year's Eve custom it was prescribed that the children of the house wear ugly masks while sleeping, so as to conceal any beauty and thereby avoid attracting the goddess, who would be passing through sometime that night. If a case of smallpox did occur, shrines would be set up in the homes of the victims, to be worshipped and offered to as the disease ran its course. If the victim recovered, the shrines were removed and carried away in a special paper chair or boat for burning. If the patient did not recover, the shrine was destroyed and cursed, so as to expel the goddess from the house. India's first records of smallpox can be found in a medical book that dates back to 400 CE. This book describes a disease that sounds exceptionally like smallpox. India, like China, created a goddess in response to its exposure to smallpox. The Hindu goddess Shitala was both worshipped and feared during her reign. It was believed that this goddess was both evil and kind and had the ability to inflict victims when angered, as well as calm the fevers of the already afflicted. 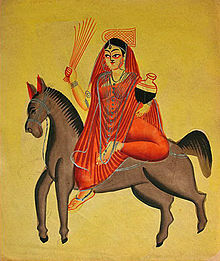 Portraits of the goddess show her holding a broom in her right hand to continue to move the disease and a pot of cool water in the other hand in an attempt to soothe victims. Shrines were created where many India natives, both healthy and not, went to worship and attempt to protect themselves from this disease. Some Indian women, in an attempt to ward off Shitala, placed plates of cooling foods and pots of water on the roofs of their homes. In cultures that did not recognize a smallpox deity, there was often nonetheless a belief in smallpox demons, who were accordingly blamed for the disease. Such beliefs were prominent in Japan, Europe, Africa, and other parts of the world. Nearly all cultures who believed in the demon also believed that it was afraid of the color red. This led to the invention of so-called red treatment, where victims and their rooms would be decorated in red. The practice spread to Europe in the 12th century and was practiced by (among others) Charles V of France and Elizabeth I of England. Afforded scientific credibility through the studies by Finsen showing that red light reduced scarring, this belief persisted even until the 1930s. ^ Barton, Leslie L.; Friedman, Neil R. (2008). The Neurological Manifestations of Pediatric Infectious Diseases and Immunodeficiency Syndromes. Springer Science & Business Media. p. 151. ISBN 978-1-59745-391-2. ^ Schaller, Karl F. (2012). Colour Atlas of Tropical Dermatology and Venerology. Springer Science & Business Media. p. Chapter 1. ISBN 978-3-642-76200-0. ^ a b c d e f g Fenner, F. (1988). "The History of Smallpox and its Spread Around the World" (PDF). Smallpox and its eradication. Geneva: World Health Organization. pp. 209–44. ISBN 978-92-4-156110-5. Retrieved 14 December 2017. ^ a b Medicine: The Definitive Illustrated History. Penguin. 2016. p. 100. ISBN 978-1-4654-5893-3. ^ a b c d e f g h i "Signs and Symptoms". CDC. 7 June 2016. Retrieved 14 December 2017. ^ a b c d e "What is Smallpox?". CDC. 7 June 2016. Retrieved 14 December 2017. ^ a b Ryan KJ, Ray CG, eds. (2004). Sherris Medical Microbiology (4th ed.). McGraw Hill. pp. 525–28. ISBN 978-0-8385-8529-0. ^ a b "Diagnosis & Evaluation". CDC. 25 July 2017. Retrieved 14 December 2017. ^ a b c "Prevention and Treatment". CDC. 13 December 2017. Retrieved 14 December 2017. ^ a b c d e f g h i j k l "Smallpox". WHO Factsheet. Archived from the original on 21 September 2007. ^ a b Riedel, S (January 2005). "Edward Jenner and the history of smallpox and vaccination". Proceedings (Baylor University. Medical Center). 18 (1): 21–25. doi:10.1080/08998280.2005.11928028. PMC 1200696. PMID 16200144. ^ Lebwohl, Mark G.; Heymann, Warren R.; Berth-Jones, John; Coulson, Ian (2013). Treatment of Skin Disease E-Book: Comprehensive Therapeutic Strategies. Elsevier Health Sciences. p. 89. ISBN 978-0-7020-5236-1. ^ a b "History of Smallpox". CDC. 25 July 2017. Retrieved 14 December 2017. ^ a b c d Hays, J.N. (2005). Epidemics and Pandemics: Their Impacts on Human History. ABC-CLIO. pp. 151–52. ISBN 978-1-85109-658-9. ^ Microbe hunters, then and now. Medi-Ed Press. 1996. p. 23. ISBN 978-0-936741-11-6. ^ Henderson, Donald A. (30 December 2011). "The eradication of smallpox – An overview of the past, present, and future". Vaccine. 29: D8 – via Science Direct. ^ Henderson, D (2009). Smallpox : the death of a disease. Prometheus Books. p. 12. ISBN 978-1-61592-230-7. ^ Guidotti, Tee L. (2015). Health and Sustainability: An Introduction. Oxford University Press. p. T290. ISBN 978-0-19-932568-9. ^ Roossinck, Marilyn J. (2016). Virus: An Illustrated Guide to 101 Incredible Microbes. Princeton University Press. p. 126. ISBN 978-1-4008-8325-7. ^ a b Barquet N, Domingo P (15 October 1997). "Smallpox: the triumph over the most terrible of the ministers of death". Annals of Internal Medicine. 127 (8 Pt 1): 635–42. CiteSeerX 10.1.1.695.883. doi:10.7326/0003-4819-127-8_Part_1-199710150-00010. PMID 9341063. ^ a b "CDC Smallpox". Smallpox Overview. Archived from the original on 2 April 2013. Retrieved 26 December 2007. ^ a b c d e f g h i j k l m n o p q r s t u v Atkinson W, Hamborsky J, McIntyre L, Wolfe S, eds. (2005). "Smallpox" (PDF). Epidemiology and Prevention of Vaccine-Preventable Diseases (The Pink Book) (9th ed.). Washington DC: Public Health Foundation. pp. 281–306. Archived from the original (PDF) on 6 March 2010. ^ a b c d e f g h i "Smallpox". Armed Forces Institute of Pathology: Department of Infectious and Parasitic Diseases. Archived from the original on 9 October 2007. Retrieved 28 October 2008. ^ a b Hogan CJ, Harchelroad F (22 August 2018). "CBRNE – Smallpox". EMedicine. Retrieved 23 September 2006. ^ a b c d "Smallpox Disease and Its Clinical Management" (PDF). From the training course titled "Smallpox: Disease, Prevention, and Intervention" (www.bt.cdc.gov/agent/smallpox/training/overview). Retrieved 26 December 2007. ^ a b c d e f g h i j Fenner, Frank (1988). Smallpox and Its Eradication (History of International Public Health, No. 6) (PDF). Geneva: World Health Organization. ISBN 978-92-4-156110-5. ^ a b Preston, Richard (12 July 1999). "A reporter at large: Demon in the Freezer". The New Yorker. Retrieved 3 January 2008. ^ Esposito JJ, Sammons SA, Frace AM, Olsen-Rasmussen M, et al. (August 2006). "Genome sequence diversity and clues to the evolution of variola (smallpox) virus". Science (Submitted manuscript). 313 (5788): 807–12. Bibcode:2006Sci...313..807E. doi:10.1126/science.1125134. PMID 16873609. ^ a b Li Y, Carroll DS, Gardner SN, Walsh MC, Vitalis EA, Damon IK (2007). "On the origin of smallpox: correlating variola phylogenics with historical smallpox records". Proc Natl Acad Sci USA. 104 (40): 15787–92. Bibcode:2007PNAS..10415787L. doi:10.1073/pnas.0609268104. PMC 2000395. PMID 17901212. ^ a b Hughes AL, Irausquin S, Friedman R (2010). "The evolutionary biology of pox viruses". Infection, Genetics and Evolution. 10 (1): 50–59. doi:10.1016/j.meegid.2009.10.001. PMC 2818276. PMID 19833230. ^ Duggan, AT; Perdomo, MF; Piombino-Mascali, D; Marciniak, S; Poinar, D; Emery, MV; Buchmann, JP; Duchêne, S; Jankauskas, R; Humphreys, M; Golding, GB; Southon, J; Devault, A; Rouillard, JM; Sahl, JW; Dutour, O; Hedman, K; Sajantila, A; Smith, GL; Holmes, EC; Poinar, HN (5 December 2016). "17th Century Variola Virus Reveals the Recent History of Smallpox". Current Biology. 26 (24): 3407–12. Bibcode:1996CBio....6.1213A. doi:10.1016/j.cub.2016.10.061. PMC 5196022. PMID 27939314. ^ Dubochet J, Adrian M, Richter K, Garces J, Wittek R (1994). "Structure of intracellular mature vaccinia virus observed by cryoelectron microscopy". J. Virol. 68 (3): 1935–41. PMC 236655. PMID 8107253. ^ a b Moss B (2006). "Poxviridae: the viruses and their replication". In Fields BN, Knipe DM, Howley PM, et al. (eds.). Fields Virology. Vol 2 (5th ed.). Philadelphia, PA: Lippincott-Raven. pp. 2905–46. ISBN 978-0-7817-6060-7. ^ Damon I (2006). "Poxviruses". In Fields BN, Knipe DM, Howley PM, et al. (eds.). Fields Virology. Vol 2 (5th ed.). Philadelphia, PA: Lippincott-Raven. pp. 2947–76. ISBN 978-0-7817-6060-7. ^ Henderson DA, Inglesby TV, Bartlett JG, Ascher MS, Eitzen E, Jahrling PB, Hauer J, Layton M, McDade J, Osterholm MT, O'Toole T, Parker G, Perl T, Russell PK, Tonat K (1999). "Smallpox as a biological weapon: medical and public health management. Working Group on Civilian Biodefense". JAMA. 281 (22): 2127–37. doi:10.1001/jama.281.22.2127. PMID 10367824. ^ Riedel S (January 2005). "Smallpox and biological warfare: a disease revisited". Proc (Bayl Univ Med Cent). 18 (1): 13–20. doi:10.1080/08998280.2005.11928026. PMC 1200695. PMID 16200143. ^ "Smallpox: Current, comprehensive information on pathogenesis, microbiology, epidemiology, diagnosis, treatment, and prophylaxis". Center for Infectious Disease Research & Policy. Retrieved 27 December 2007. ^ LeDuc JW, Jahrling PB (2001). "Strengthening national preparedness for smallpox: an update". Emerging Infect. Dis. 7 (1): 155–57. doi:10.3201/eid0701.010125. PMC 2631676. PMID 11266310. ^ Wujastyk, Dominik. (1995). "Medicine in India," in Oriental Medicine: An Illustrated Guide to the Asian Arts of Healing, 19–38. Edited by Serindia Publications. London: Serindia Publications. ISBN 0-906026-36-9. p. 29. ^ Temple, Robert. (1986). The Genius of China: 3,000 Years of Science, Discovery, and Invention. With a foreword by Joseph Needham. New York: Simon and Schuster, Inc. ISBN 0-671-62028-2. pp. 135–37. ^ Silverstein, Arthur M. (2009). A History of Immunology (2nd ed.). Academic Press. p. 293. ISBN 978-0-08-091946-1. .
^ "Modern History Sourcebook: Lady Mary Wortley Montagu (1689–1762): Smallpox Vaccination in Turkey". Fordham.edu. Retrieved 15 October 2010. ^ "Frequently Asked Questions About Smallpox Vaccine". Centers for Disease Control and Prevention. 7 February 2007. Archived from the original on 16 November 2015. Retrieved 28 December 2010. ^ a b c "Vaccine Overview" (PDF). Smallpox Fact Sheet. Archived from the original (PDF) on 2 January 2008. Retrieved 2 January 2008. ^ Mack TM (1972). "Smallpox in Europe, 1950–1971". J. Infect. Dis. 125 (2): 161–69. doi:10.1093/infdis/125.2.161. PMID 5007552. ^ Pütz MM, Alberini I, Midgley CM, Manini I, Montomoli E, Smith GL (2005). "Prevalence of antibodies to Vaccinia virus after smallpox vaccination in Italy". J. Gen. Virol. 86 (Pt 11): 2955–60. doi:10.1099/vir.0.81265-0. PMID 16227216. ^ a b Fenner, Frank (1988). "Development of the Global Smallpox Eradication Programme" (PDF). Smallpox and Its Eradication (History of International Public Health, No. 6). Geneva: World Health Organization. pp. 31, 125. ISBN 978-92-4-156110-5. ^ Commissioner, Office of the. "Press Announcements – FDA approves the first drug with an indication for treatment of smallpox". www.fda.gov. Retrieved 28 July 2018. ^ Bray M, Roy CJ (2004). "Antiviral prophylaxis of smallpox". J. Antimicrob. Chemother. 54 (1): 1–5. doi:10.1093/jac/dkh286. PMID 15163655. ^ Metzger W, Mordmueller BG (2007). "Vaccines for preventing smallpox". Cochrane Database Syst Rev (3): CD004913. doi:10.1002/14651858.CD004913.pub2. PMID 17636779. ^ FDA/CBER Questions and Answers; Medication Guide; accessed 1 March 2008. ^ Shchelkunov SN (December 2011). "Emergence and reemergence of smallpox: the need for development of a new generation smallpox vaccine". Vaccine. 29 Suppl 4: D49–53. doi:10.1016/j.vaccine.2011.05.037. PMID 22185833. ^ Hopkins, Donald. "Ramses V:Earliest known victim?" (PDF). WHO. Retrieved 6 July 2010. ^ Henderson, D.A. ; Preston, Richard (23 June 2009). Smallpox- the Death of a Disease: The Inside Story of Eradicating a Worldwide Killer (1st ed.). Prometheus Books. p. 334. ISBN 978-1-59102-722-5. ^ "Child Mummy Found With Oldest Known Smallpox Virus". 8 December 2016. Retrieved 9 December 2016. ^ Duggan AT, Perdomo MF, Piombino-Mascali D, Marciniak S, Poinar D, Emery MV, Buchmann JP, Duchêne S, Jankauskas R, Humphreys M, Golding GB, Southon J, Devault A, Rouillard JM, Sahl JW, Dutour O, Hedman K, Sajantila A, Smith GL, Holmes EC, Poinar HN (2016). "17th Century Variola Virus Reveals the Recent History of Smallpox". Curr Biol. 26 (24): 3407–12. doi:10.1016/j.cub.2016.10.061. PMC 5196022. PMID 27939314. ^ Dixon, C.W. (1962). Smallpox. London: Churchill. ^ Harminder S. Dua, Ahmad Muneer Otri, Arun D. Singh (2008). "Abu Bakr Razi". British Journal of Ophthalmology. 92: 1324. ^ Koplow, David A. (2003). "Smallpox The Fight to Eradicate a Global Scourge". University of California Press. Archived from the original on 7 September 2008. Retrieved 22 February 2009. ^ Glynn, Ian; Glynn, Jenifer (2004). The life and death of smallpox. Cambridge University Press. p. 145. ISBN 978-0-521-84542-7. ^ Stanley A Plotkin; Walter A Orenstein; Donald A. Henderson; Bernard Moss. "Smallpox and Vaccinia". Archived from the original on 1 June 2009. Retrieved 15 October 2010. ^ Needham J (1999). "Part 6, Medicine". Science and Civilization in China: Volume 6, Biology and Biological Technology. Cambridge: Cambridge University Press. p. 134. ^ Needham, Joseph (2000). Science and Civilisation in China: Volume 6, Biology and Biological Technology, Part 6, Medicine. Cambridge University Press. p. 154. ISBN 9780521632621. ^ Silverstein, Arthur M. (2009). A History of Immunology (2nd ed.). Academic Press. p. 293. ISBN 9780080919461. .
^ Ben-Menahem, A. (2009). Historical Encyclopedia of Natural and Mathematical Sciences. Historical Encyclopedia of Natural and Mathematical Sciences by Ari Ben-Menahem. Berlin: Springer. Historical Encyclopedia of Natural and Mathematical Sciences. Springer. p. 1497. Bibcode:2009henm.book.....B. ISBN 978-3-540-68831-0. Retrieved 31 January 2017. ^ Handcock, Gordon. The Story of Trinity. Trinity: The Trinity Historical Society. p. 1. ISBN 978-0-9810017-0-8. ^ "Dr. Francisco de Balmis and his Mission of Mercy". Society of Philippine Health History. Archived from the original on 23 December 2004. Retrieved 14 July 2015. ^ "Against all odds: vanquishing smallpox in far-flung Japan" (PDF). 2007. Retrieved 14 July 2015. ^ "The control and eradication of smallpox in South Asia". University of York. 2015. Retrieved 14 July 2015. ^ "Atsuko Naono, State of Vaccination: The Fight Against Smallpox in Colonial Burma". Indianmedicine.eldoc.ub.rug.nl. Archived from the original on 24 July 2011. Retrieved 15 October 2010. ^ "Chapter 3 – Indian Health Program". Indian Health Service. 12 January 1976. Retrieved 8 February 2012. ^ Durbach, Nadja (2005). Bodily Matters: The Anti-Vaccination Movement in England, 1853–1907. ISBN 978-0-8223-3423-1. ^ a b c Orenstein, Walter A.; Plotkin, Stanley A. (1999). Vaccines (e–book). Philadelphia: W.B. Saunders Co. ISBN 978-0-7216-7443-8. ^ Rodrigues BA (1975). "Smallpox eradication in the Americas". Bull Pan Am Health Organ. 9 (1): 53–68. PMID 167890. ^ a b Fenner, Frank (1988). "Development of the Global Smallpox Eradication Programme" (PDF). Smallpox and Its Eradication (History of International Public Health, No. 6). Geneva: World Health Organization. pp. 366–418. ISBN 978-92-4-156110-5. ^ Fenner, Frank (1988). "The Intensified Smallpox Eradication Programme" (PDF). Smallpox and Its Eradication (History of International Public Health, No. 6). Geneva: World Health Organization. pp. 422–538. ISBN 978-92-4-156110-5. ^ "Karel Raška and Smallpox" (PDF). Central European Journal of Public Health. March 2010. Retrieved 15 July 2015. ^ "Karel Raška – The Development of Modern Epidemiology. The role of the IEA" (PDF). Central European Journal of Public Health. March 2010. Retrieved 15 July 2015. ^ Flight, Colette (17 February 2011). "Smallpox: Eradicating the Scourge". BBC History. Retrieved 28 July 2015. ^ Centers for Disease Control and Prevention (CDC) (1996). "International Notes – Quarantine Measures Smallpox – Stockholm, Sweden, 1963". MMWR. 45 (25): 538–45. PMID 9132571. ^ Grimes, William (25 November 2010). "Frank Fenner Dies at 95". NYTimes.com. Retrieved 27 November 2010. ^ Fenner, Frank (2006). Nature, Nurture and Chance: The Lives of Frank and Charles Fenner. Canberra, ACT 0200: Australian National University Press. ISBN 978-1-920942-62-5. ^ Pennington H (2003). "Smallpox and bioterrorism" (PDF). Bull. World Health Organ. 81 (10): 762–67. doi:10.1590/S0042-96862003001000014 (inactive 21 March 2019). PMC 2572332. PMID 14758439. Retrieved 11 February 2018. ^ a b Pallen, Mark (2018). The Last Days of Smallpox: Tragedy in Birmingham. UK: Amazon KDP. ISBN 978-1-9804-5522-6. ^ Shooter, R.A. (22 July 1980). "Report of the Investigation into the Cause of the 1978 Birmingham Smallpox Occurrence" (PDF). London: Her Majesty's Stationery Office. Retrieved 8 July 2014. ^ Connor, Steve (3 January 2002). "How terrorism prevented smallpox being wiped off the face of the planet for ever". London: The Independent. Archived from the original on 28 October 2011. Retrieved 18 May 2016. ^ Altman, Lawrence (25 January 1996). "Final Stock of the Smallpox Virus Now Nearer to Extinction in Labs". New York Times. Retrieved 23 November 2007. ^ MacKenzie, Debora (26 January 2002). "Stay of execution". New Scientist. Retrieved 23 November 2007. ^ Hammond, Edward (2007). "Should the US and Russia destroy their stocks of smallpox virus?". BMJ. 334 (7597): 774. doi:10.1136/bmj.39155.695255.94. PMC 1851992. PMID 17431261. ^ Agwunobi JO (2007). "Should the US and Russia destroy their stocks of smallpox virus?". BMJ. 334 (7597): 775. doi:10.1136/bmj.39156.490799.BE. PMC 1851995. PMID 17431262. ^ Lane JM, Poland GA (2011). "Why not destroy the remaining smallpox virus stocks?". Vaccine. 29 (16): 2823–24. doi:10.1016/j.vaccine.2011.02.081. PMID 21376120. ^ "Century-old smallpox scabs in N.M. envelope". USA Today: Health and Behavior. 26 December 2003. Retrieved 23 September 2006. ^ "Forgotten smallpox vials found in cardboard box at Maryland laboratory". The Guardian. 8 July 2014. Retrieved 16 July 2015. ^ "FDA found more than smallpox vials in storage room". The Washington Post. 16 July 2014. Retrieved 24 February 2017. ^ "Report of the Blue Ribbon Panel to Review the 2014 Smallpox (Variola) Virus Incident on the NIH Campus" (PDF). National Institutes of Health. Retrieved 24 February 2018. ^ "How Canadian researchers reconstituted an extinct poxvirus for $100,000 using mail-order DNA". Science Magazine. 6 July 2017. ^ Anderson, Crucible of War, 809n; Grenier, First Way of War, 144; Nester, Haughty Conquerors", 114–15. ^ Anderson, Crucible of War, 541–42; Jennings, Empire of Fortune, 447n26. ^ a b Flight, Colette (17 February 2011). "Silent Weapon: Smallpox and Biological Warfare". BBC History. Retrieved 28 July 2015. ^ Warren, Christopher (2013). "Smallpox at Sydney Cove – who, when, why?". Journal of Australian Studies. 38: 68–86. doi:10.1080/14443058.2013.849750. ^ "Smallpox and Cowpox Under the Southern Cross: The Smallpox Epidemic of 1789", Vol. 83 pt. 1, pp. 37–62. ^ HarperCollinsPublishers, Sydney, 2001, pp. 42ff. ^ "Chicken pox or smallpox in the colony at Sydney Cove in April, 1789". Radio National. 17 September 2010. ]. ^ Glynn, Ian; Glynn, Jenifer (2004). The life and death of smallpox, Cambridge University Press, p. 145. ISBN 978-0-521-84542-7. ^ Warren, C. "Could First Fleet smallpox infect Aborigines? – A note". Aboriginal History. 31: 152–164. ^ See https://www.geni.com/people/Joseph-Jeffries-Crew-Supply-1788/6000000073111673102 and http://www.ffghs.org.au/page8.php . ^ Carus, W. S. (2015). "The History of Biological Weapons Use: What We Know and What We Don't". Health Security. 13 (4): 219–55. doi:10.1089/hs.2014.0092. PMID 26221997. ^ See fuller discussion of their views and those of Dr G. E. Ford in "The History Wars: Smallpox Debates". ^ "USAMRIID's Medical Management of Biological Casualties Handbook" (PDF). Retrieved 18 July 2015. ^ Alibek K, Handelman S (1999). Biohazard: The Chilling True Story of the Largest Covert Biological Weapons Program in the World – Told from Inside by the Man Who Ran It. New York: Delta. ISBN 978-0-385-33496-9. ^ Shoham D, Wolfson Z (2004). "The Russian biological weapons program: vanished or disappeared?". Crit. Rev. Microbiol. 30 (4): 241–61. doi:10.1080/10408410490468812. PMID 15646399. Archived from the original on 1 October 2007. ^ "Smallpox – not a bad weapon". Interview with General Burgasov (in Russian). Moscow News. Archived from the original on 14 October 2007. Retrieved 18 June 2007. ^ Enserink M (2002). "Biowarfare. Did bioweapons test cause a deadly smallpox outbreak?". Science. 296 (5576): 2116–17. doi:10.1126/science.296.5576.2116. PMID 12077372. ^ Bellomo, Michael; Zelicoff, Alan P. (2005). Microbe: are we ready for the next plague?. New York: American Management Association. p. 101. ISBN 978-0-8144-0865-0. ^ a b Preston, Richard (2003). The Demon in the Freezer. Fawcett. pp. 105–15. ISBN 978-0-345-46663-1. ^ History and Epidemiology of Global Smallpox Eradication Archived 15 July 2007 at the Wayback Machine From the training course titled "Smallpox: Disease, Prevention, and Intervention". The CDC and the World Health Organization. Slide 16–17. ^ Burkeman, Oliver (19 September 2003). "No evidence of smallpox". The Guardian. Accessed 10 May 2012. ^ a b The Genetic Engineering of Smallpox. WHO's Retreat from the Eradication of Smallpox Virus and Why it Should be Stopped A Briefing Paper by the Sunshine Project. 2002. ^ Smallpox Virus Stocks at the 64th WHA – Implementing the Conclusions of the Major Review Third World Network, Briefing Paper by Edward Hammond, p. 8. ^ Koplow, David (2003). Smallpox: The Fight to Eradicate a Global Scourge. Berkeley and Los Angeles: University of California Press. ISBN 978-0-520-23732-2. ^ "President Abraham Lincoln: Health & Medical History". 24 March 2007. Retrieved 18 June 2007. ^ Massie, Robert K. (2011). Catherine the Great: Portrait of as Woman, pp. 387–88. Random House, New York. ISBN 978-0-679-45672-8. ^ a b c Oldstone, Michael (2010). Viruses, Plagues, and History. Oxford University Press. pp. 65–71. ISBN 978-0-19-532731-1. ^ "Biography at the Edwards Center at Yale University". Yale University. Retrieved 13 September 2009. ^ a b Hopkins, Donald R. Princes and Peasants: Smallpox in History. United States of America: University of Chicago Press, 1983. ^ a b c d Giblin, James C. When Plague Strikes: The Black Death, Smallpox, AIDS. United States of America: HarperCollins Publishers, 1995. ^ Wiley, Andrea S., & Allen, John S. Medical Anthropology: A Biocultural Approach. New York: Oxford University Press, 2009. ^ Tucker, Jonathan B. Scourge: The Once and Future Threat of Smallpox. New York: Atlantic Monthly Press, 2001. Bhattacharya, Sanjoy (2006). Expunging variola: the control and eradication of smallpox in India, 1947–1977. Hyderabad: Orient Longman. ISBN 978-81-250-3018-8. Fenner, Frank (1988). Smallpox and Its Eradication (History of International Public Health, No. 6) (PDF). Geneva: World Health Organization. ISBN 978-92-4-156110-5. Koplow, David A. (2003). Smallpox: the fight to eradicate a global scourge. Berkeley: University of California Press. ISBN 978-0-520-24220-3. Mack T (2003). "A different view of smallpox and vaccination". N. Engl. J. Med. 348 (5): 460–63. doi:10.1056/NEJMsb022994. PMID 12496354. McNeill, William Hardy (1977). Plagues and peoples. Oxford: Basil Blackwell. ISBN 978-0-385-12122-4. Naono, Atsuko (2009). State of Vaccination: The Fight Against Smallpox in Colonial Burma. Hyderabad: Orient Blackswan. p. 238. ISBN 978-81-250-3546-6. Pallen, Mark (2018). The Last Days of Smallpox: Tragedy in Birmingham. UK: Amazon KDP. ISBN 978-1-9804-5522-6. Reinhardt, Bob H. (2015) The End of a Global Pox: America and the Eradication of Smallpox in the Cold War Era (U of North Carolina Press, 2015). xviii, 268 pp. Tucker, Jonathan B. (2001). Scourge: The Once and Future Threat of Smallpox. New York: Grove Press. ISBN 978-0-8021-3939-9. Lord Wharncliffe; W. Moy Thomas, eds. (1861). The Letters and Works of Lady Mary Wortley Montagu, vol. 1. London: Henry G. Bohn.